The Member Portal allows you to protect your web pages and make them accessible only to a selected set of users. Through this, you can make some of your web content accessible only through authentication. The Member Portal contains an access control list, in which you can specify which members get to view restricted pages and/or files on your website. Once the Member Portal is setup for your website, you can add members by enabling registration or by inviting them to join your portal. You can also give permission to view pages/files to individual members or groups. Providing permission to a group enables all its group members to access the pages or files assigned to that specific group. Member Portal allows you to create multiple groups of members to assign permission with ease. This guide will walk you through the features of Member Portal. Click on the Manage drop-down menu and select Member Portal. The menu on the left contains three options- Preferences, Users and Groups. In this section, set the preferences for your member portal. 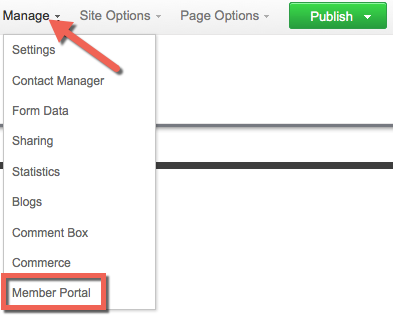 Here you can choose to enable or disable your member portal. Note: If you choose to disable the member portal, the pages in your member portal cannot be accessed by any of your website visitors and will display a Permission Denied message. 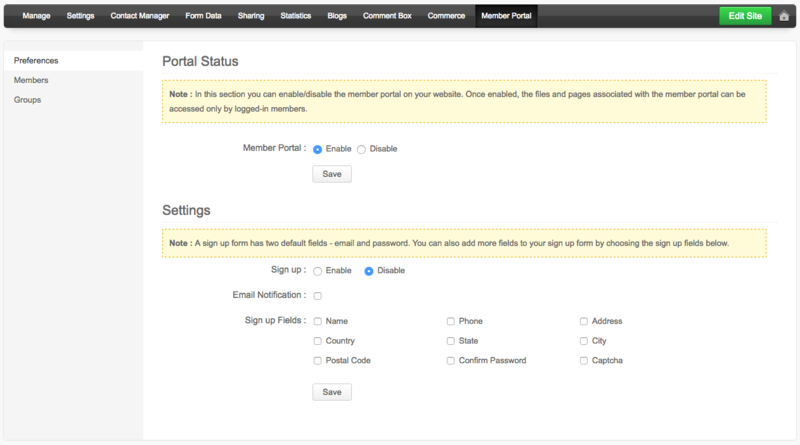 Here you can choose to enable or disable a sign up form for your member portal. If you enable sign up, users should sign up to your member portal to become a member to access restricted content. If you disable sign up, you can decide who becomes a member by sending the person an invitation to sign up. Only people who receive the invitation can sign up for your member portal. Select this option if you would like to be notified,(via email) every time a new person signs up to your member portal. Users who would like to sign up need to fill out a form. You can pick which fields go in to the form by selecting them. When you need to look for existing users, you can type out the first part of the user’s email address in the search box and click Find Member. From the search results you can gather the details of a member by clicking on View Info. You can edit a member's details on the Member Info page. Additionally you can add members to a group and provide access to pages and files to the members of this group. To view pages that the member has access to, click on Pages. To provide the member with access to a new page, click on add page and select the pages which you would like to give permission to access. To view files that the member has access to, click on Files. To give the member access to a new file, click on add file and select the files which you would like to give permission to access. To invite a user, click the Invite Users button. Enter their email addresses and the group name to which you want to add them to and click Invite. Users who have not accepted your invitation will appear in the Pending List. From this list, you can re-invite users to send them an invitation again. Using the Export Members option, you may export the members list in a .csv file format. Creating groups will make sharing accessibility faster and easier. You can easily share files and pages with any of the member groups. What is the 'All Members' Group? The All Members group is a default group created for you. The visitors who sign up to your portal will automatically be added to the All Members group. You can enable accessibility to files and pages for all the signed-up users by sharing it to this group. If you do not want certain files/pages to be visible to users who sign-up on their own, add those files/pages to a group that you have created or remove those pages/files from the 'All Members' group. You can get the details of a group from the list of groups you have created, by clicking on the View Info option. You can then add members, pages and files to the group and also remove them from a group. Who can view the files and pages? Only the members who belong to the group can view the files and pages added to the group. Pages and files added to the 'All Members' group will be accessible to all members who sign-up. How do users sign-up on their own? 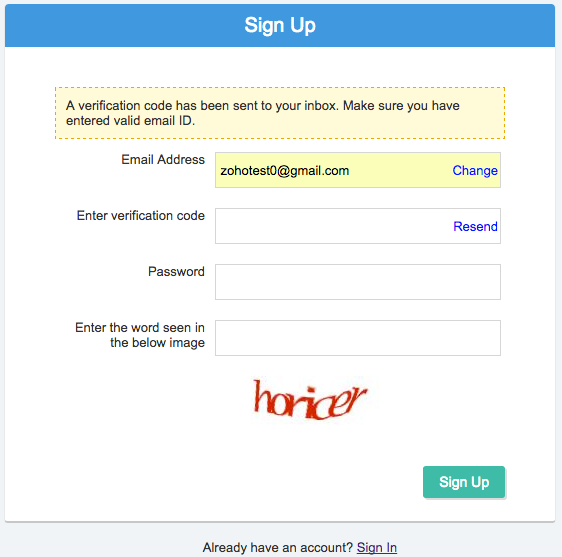 When a user visits a website that has the member portal enabled, he/she will find the option to sign-in or sign-up on the top right-hand side. Similarly, when a user visits a page that is part of the member portal, he/she will be prompted to either sign-in or sign-up. Users who have not yet signed-up can sign-up and will be able to view the files and pages associated with the all members group by default. When a user clicks on sign-up and enters his/her email address, a token will be sent to the user's email address. User will have to then enter the token number and complete the sign-up process. There are possibilities of the email with the token number to land in the junk/spam folder as well. 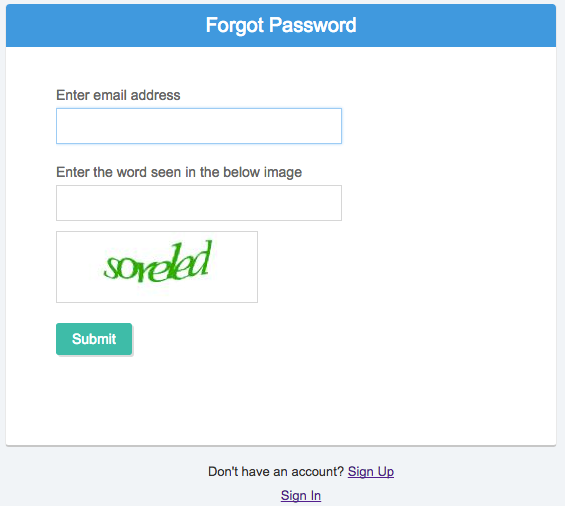 What is the password field in the sign-up form for? The password field in the sign-up form is for the password that you would like to setup for your member portal access. Once your member portal access is created, and you forget your password, you may use the 'Forgot Password?' option in the sign-in page to be able to reset your password. Only the member will be able to reset his/her password and the website admin does not have access to the passwords of the users. How do users edit their password or information associated with their member portal account? Once a user signs in, he/she can click on the username on the top right-hand side, and will find the option to change the password and the information associated with the member profile. Is there a limit on the number of members that can be added to the portal? Yes, there is. By default 2,000 members can be added to the member portal. If you would like to add more members, contact support. Note: Blogs, external link pages and password protected pages cannot be added to pages list in the member portal.